Growing up, my family had a Christmas morning tradition. We always ate a fun breakfast pastry. I remember not caring too much about the pastries, or the effort my mother took to prepare them, until I was a bit older. But it’s a tradition I have embraced and truly enjoy as an adult. This recipe for Festive Cranberry Cream Loaves looks long – but if you can follow basic bread-making directions, you’ll be fine. And it’s worth the effort. Grab the ingredients on the last trip you make to the grocery and spend some time on Christmas Eve afternoon (that’s a mouth full!) making this gorgeous breakfast. It’s certainly enough to feed a crowd, but if your family is small, well – more for you! Cuz it’s no small task to eat just one slice of this! It’s the perfect companion to coffee, tea or cocoa and fits in well with gift-opening frenzies in your PJs or on an elegany holiday tablescape. Wait – you’re looking for the recipe! Gotcha! It’s crossed posted today at the Sister Eden Blog, where we are guest vegan-writing. (I just made that phase up right now.) So click here to get the recipe and all the details. Enjoy!! Both of us wish you and yours a safe, happy and healthy holiday! Here’s to a wonderful Christmas breakfast! Not sure where you are reading from, but here in Baltimore, winter can be COLD. Okay, so today is like 62-degrees. but that’s weird for December. Just a few nights ago, it was 19-degrees. Which brings me to GLOVES. Whenever it’s time to get bundled up, I feel a little like the younger brother in the movie “The Christmas Story” – the one so wrapped in layers of clothes and scarves he can’t get up when he falls in the snow? Over time, I have learned there are better, more stylish and greener bundling options when it comes to gloves. Like these arm warmers. They were handmade in San Francisco by Sachiko Morino. They’re created from a blend of bamboo and organic cotton, with 3% spandex for stretch. You can handwash or machine-wash on gentle. They’re drip-dry and available in a variety of colors. And they are wonderful for layering! All for $27. Sachiko makes a lot of other items in bamboo-cotton blends too, like skirts, tops and shrugs. These arm warmers are actually designed for dancers to wear during practice, however, they are super for putting under itchy sweaters, making a favorite tee “long-sleeved” in winter and generally just making you comfy in cold weather! They wash well and have maintained their shape and color over the past year (I have black and red). Super idea, Sachiko – and thanks for using sustainable fabrics! Looking for something more “outer wear”? How about recycled cotton? These cuties are made in the USA and are created from pieces leftover in the garment-industry process. Basically, cotton scraps that would otherwise end up in a landfill. We got ours from Fair Indigo, a catalog/website selling “style with a conscience,” but you can also buy them directly from the designers at green3apparel in Wisconsin. green3apparel‘s unique process uses unwanted material to make a great product (ours are 2 years-old and going strong), and saves land, water and energy. Brilliant! There are glove options with peace signs, stripes, hearts and phones. The scarves by green3apparel come with birdies, doggies, trees, plain and more. We’re into it. 🙂 So log onto Fair Indigo (they have lots of other chic eco outer-wear!) or green3apparel to get your hands warmed up for winter. It’s about this time that we start trying to figure out what to eat on Christmas. Humbly, we offer this recipe into the mix. The flavors combine smoothly and will compliment many other dishes on your holiday table. Sweet Potatoes with Orange can also be served hot or cold – which is a bonus if you are headed to a potluck. This recipe marks our first collaboration with the Sister Eden blog! We’re proud to be writing vegan recipes for the good folks over there and hope you enjoy browsing their site as well. Sister Eden shares our eco-philsophy and posts lots of green and vegan-friendly ideas, products and more. 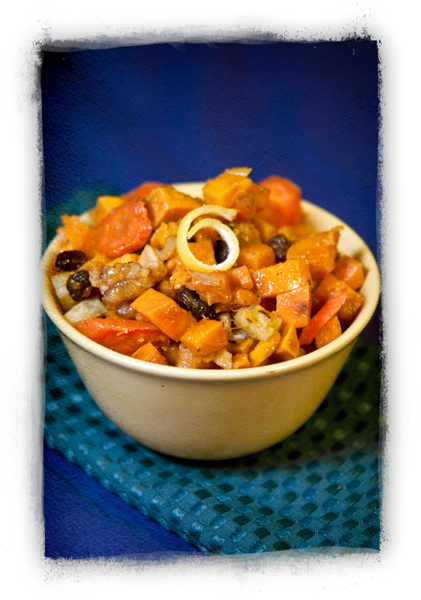 Check out the recipe at Sister Eden for these tasty Sweet Potatoes with Orange. 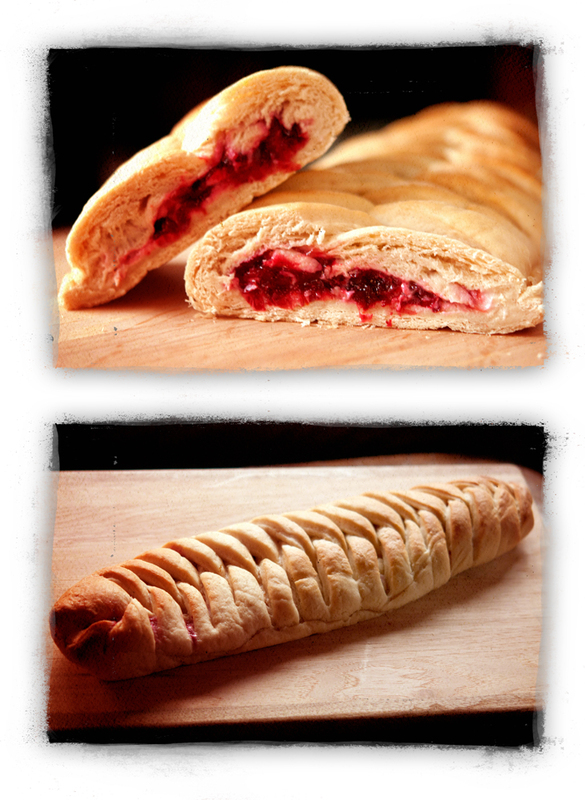 We know they will be a big hit at your holiday table!